During Prohibition, so the popular thinking goes, a drink was never far away from the thirsty despite the misguided 18th Amendment, which only served to fuel crime and fatten gangsters' wallets. 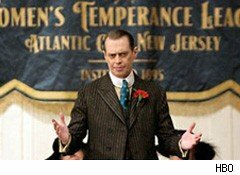 Boardwalk Empire, the new drama from Time Warner's (TWX) HBO, is also seeking to get close to the thirsty with a marketing tie-in to Canadian Club whiskey that taps into the glamorous image of the Prohibition era. Through a marketing partnership with Canadian Club, which HBO calls "a brand authentic to the period," the pay-TV network has been placing Boardwalk Empire displays and window signs in some real-world liquor stores and wine shops. The campaign also includes bar events, such as re-created speakeasies featuring a special cocktail menu. According to HBO Vice President of Brand Marketing Chris Spadaccini, the in-store displays feature crates of liquor with Canadian Club product and branding for the show. Some liquor store signs for the series have the appearance of being etched into the window glass. "Window displays are essentially street-level billboards, so these types of advertisements are helpful in reaching a broad audience," Spadaccini said in an email about the ad campaign. But that approach -- using liquor stores to target a wide range of consumers -- marks what's wrong with the campaign, according to David Jernigan, associate professor at the Johns Hopkins Bloomberg School of Public Health, and the director of the Center on Alcohol Marketing and Youth. "These are sources that children pass on the way to school. They can't be turned off," Jernigan says of the window displays, adding this campaign marks the first time he's heard of a TV show advertising in liquor-store windows. The problem, explains Jernigan, is that Prohibition, which was in effect for everyone from 1920 to 1933, still exists for anyone under the age of 21. And that's partially why he finds the campaign problematic. "Anything that glorifies violating prohibition isn't helpful" in enforcing the country's current drinking laws and keeping young adults away from alcohol, Jernigan says. He adds that he hasn't seen the show, but has read media coverage of the program. HBO, though, is hardly alone in running marketing campaigns for alcohol that could be inadvertently seen by people under 21. A study from the Center on Alcohol Marketing and Youth found that youth exposure to alcohol ads on TV jumped 38% from 2001 to 2007, with most of the increase coming from distilled spirits companies increasing their ads on cable-TV networks. One reason why kids are seeing more alcohol ads is that "brand preferences are formed by the time people reach young adulthood," Jernigan says. "Underage drinking starts to take off at age 12 and goes up steeply through the teen years," he notes. Research now shows that the peak onset of full-blown alcohol dependence for young people is age 18, he adds. HBO counters that its network is an adult TV service and that the use of the Canadian Club brand is "factually grounded in the time of Prohibition," according a spokeswoman. The campaign certainly hasn't hurt ratings: The show attracted 4.8 million viewers during its debut last month, and HBO quickly renewed the program for a second season. While a positive for Time Warner, it might just make life more difficult for alcohol researchers. After all, says Jernigan: "When we make the case that alcohol should be made more expensive, that it should be less available, we hear that we are prohibitionists and Prohibition didn't work."